Aaron Hernandez, Mr. July 2014. 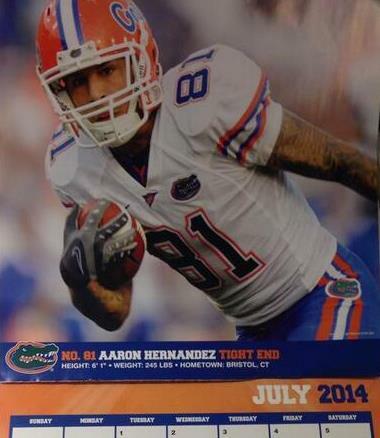 2014: Ex-Florida and New England Patriots tight end Aaron Hernandez, jailed while awaiting trial in the killings of three men, is featured as Mr. July in the Florida Gators’ 2014 sports calendar. University of Florida officials claim to have approved the calendar in the spring of 2013, months before Hernandez was arrested, on June 26, 2013, in the slaying of Odin Lloyd. Subsequently, Hernandez was also indicted on two counts of first-degree murder in the drive-by shooting of two other men, Daniel de Abreu and Safiro Furtado. 2011: Former New York Mets outfielder Bobby Bonilla receives the first of twenty-five annual installments of $1.19 million, part of a deferred compensation package totaling $29.8 million that he accepts in lieu of the $5.9 million the MLB team owed him when he was released after the 1999 season. Bonilla will be 72 years old when he receives his final annual payment (each payment is due on July 1) of $1,193,248.20 in 2035. And Bonilla isn’t the only former Mets player receiving deferred payments; pitcher Bret Saberhagen, who won only 29 games for the Mets, receives $250,000 annual payments that started in 2004 and will continue until 2028. 2002: A Bashkirian Airlines Tupolev 154 collides in midair with a DHL International Boeing 757 cargo plane over Ueberlingen in southern Germany, killing the 69 passengers and crew on the Russian plane and the two-person crew on the cargo jet. The collision occurs even though each plane had TCAS (Traffic Collision Avoidance System) collision-avoidance equipment onboard. 2000: A lakefront concrete terrace loaded with tourists collapses at a winery on Middle Bass Island in Ohio, killing one person and injuring seventy-five others.